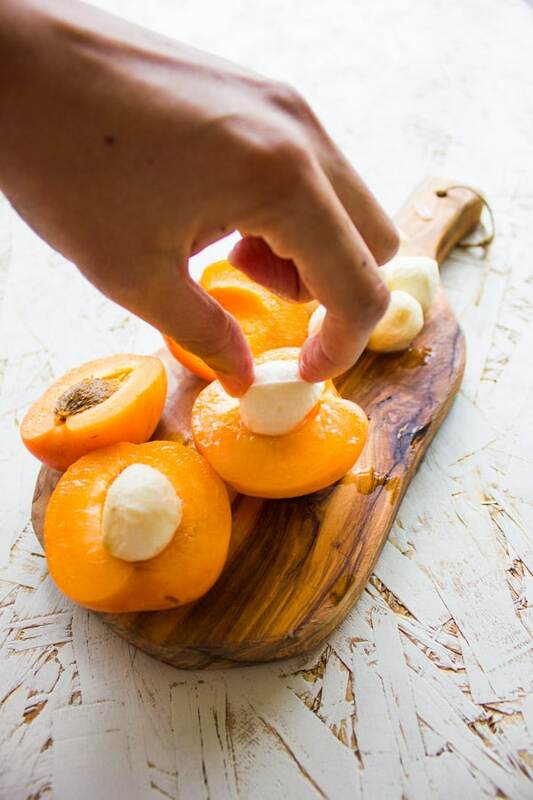 These mozzarella stuffed apricots are a quick and easy appetizer! An elegant, timeless pairing of fruit and cheese that will leave everyone impressed! 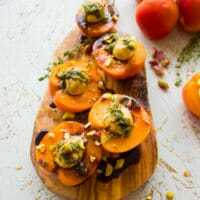 These easy, quick, vibrant and sweet mozzarella stuffed apricot appetizers are perfect for the bbq season, family gatherings, or just a romantic dinner for two. It’s a versatile appetizer to make with absolutely any type of fruit and any type of cheese. All you need is an excuse to pair them. This is a quick post, really simple and quick because look at this gorgeous and easy stuffed apricot appetizers I’m showing off with today? How simple can it get! And it’s the simplest things in life that are often (if not always) the BEST. Today’s recipe falls completely into that phrase. 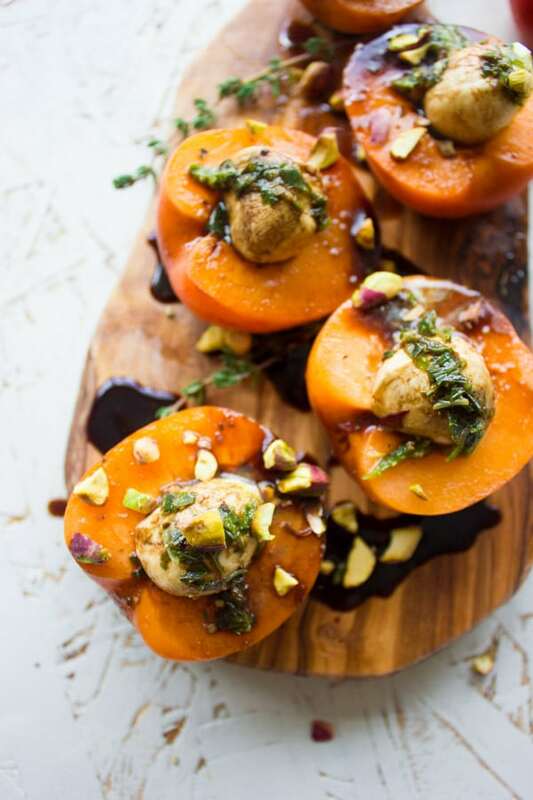 Sweet apricots and creamy mozzarella with a drizzle of balsamic vinegar and some fresh basil. I sprinkled some chopped pistachios on top because it’s one of my favorites. Each bite is a blend of sweet, tangy, smooth, crunchy, perfection! Are you all falling for fresh apricots right now? I seriously am! They’re sweet and have this beautiful texture that’s not watery like many fruits. Apricots make the best pies and tarts, the freshest salads, the sweetest cakes and bars, the tangy-sweetest sauce to drizzle on your grilled chicken. Also, they pair wonderfully with CHEESE. Any cheese. 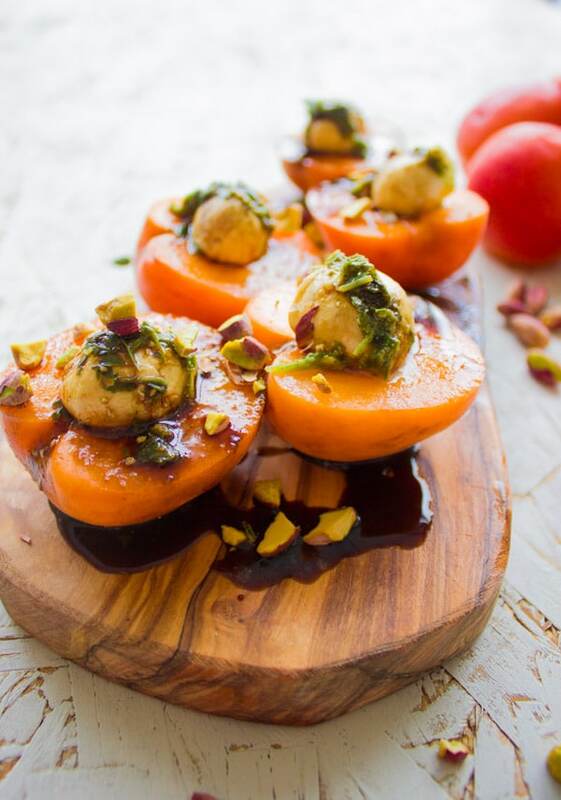 I’ve made these stuffed apricots with goat cheese, blue cheese, and even good old cream cheese– they all came out delicious! These are the perfect sweet cheese and fruit appetizer for summer bbq parties, family gatherings, finger food parties, quick appetizer to get everyone going while you’re cooking up dinner. They are a sweet way to start a romantic dinner, or just a fresh nibble for you when you’re cooking for yourself. There’s no limit to how and where you serve this fruit and cheese delicacy of an appetizer. Speaking of fruit and cheese. You couldn’t have missed one of my most popular recipes in m cooking classes. My outstanding goat cheese pistachio coated strawberries. Another fruit and cheese combo that looks and tastes like a five-star treat, while it took just minutes to make. So here I’ve picked apricots, cut them in half, and removed the pit. Then, I stuffed a nice ball of bocconcini cheese right at the center of each half where the pit was. Place them on a platter, scattered some fresh minced basil leaves and drizzled with a nice generous amount of Balsamic vinegar. Simple, easy, quick, fresh and luscious! I felt I didn’t even need salt, not a single pinch, or olive oil, nothing. For goat cheese-stuffed apricots, mix creamy goat cheese and fresh thyme leaves. 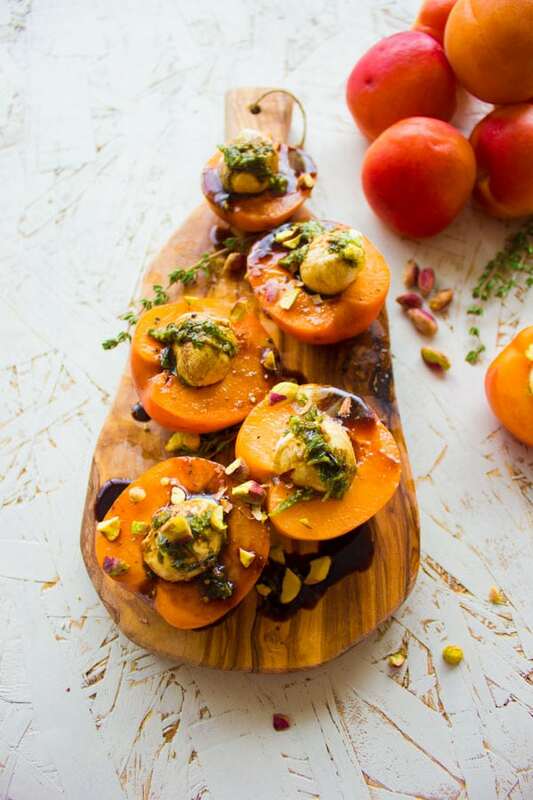 Stuff your apricots and drizzled them with honey. Cream cheese is neutral and a fabulous filling here as well. Drizzle with either balsamic or honey or both! A filling of vanilla cream cheese and honey makes for a sweet almost dessert-like finger food. 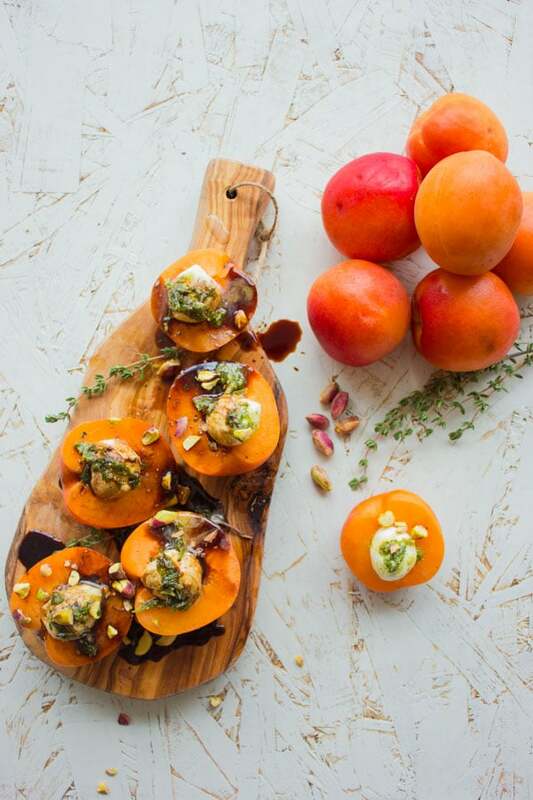 Don’t stop at apricots, play around with all the season’s fabulous fruits, like grilled peaches or plums. For more bite-sized treats, make sure to check out my Kale Veggie Mini frittata, Mini Raspberry Cheesecakes, and the ultimate chocolate cheesecake, or these Tomato Tarts Tatins! Cut each apricot in half and remove the pits. Fill each apricot half with one piece of bocconcini mozzarella. place the apricots stuffed side up on a serving platter. Sprinkle fresh basil and pistachios if using, and drizzle generously with balsamic vinegar. Serve. 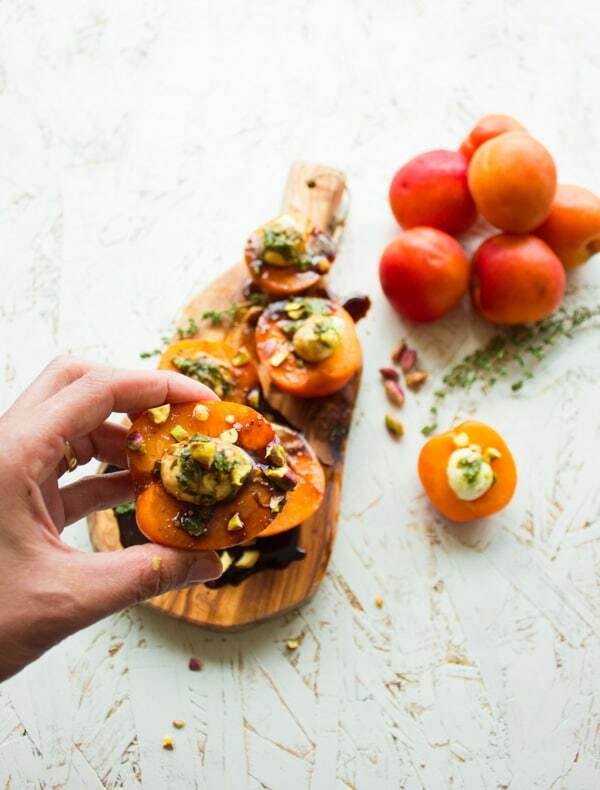 Don't stop at apricots, play around with all the season's fabulous fruits, like grilled peaches or plums.